Palestinian Authority Chairman Mahmoud Abbas on Tuesday outlawed all armed Palestinian groups except for the official PA security services. . .
"On the basis of the declaration of a state of emergency in the Palestinian territories, and by virtue of my authority, all armed militias, groups and brigades that do not belong in practice to the security services shall be treated as illegal organizations," read the first order. . . . However, it remains unclear how Abbas will enforce this order. Members of the Fatah Party's military wing [Wednesday] denied claims by the Palestinian Authority president, Mahmoud Abbas, that he had asked the group to turn in their weapons. Al-Aqsa Martyrs' Brigades said Mr. Abbas's officials instead have encouraged the organization to continue its "resistance" activities. Mr. Abbas pledged during a summit with Prime Minister Olmert on Monday that he would immediately dismantle all West Bank militias not connected to the security forces of his Fatah Party. . . .
"No one from Abbas's office ever asked us to disarm," the deputy commander of the Brigades in the northern West Bank, Nasser Abu Aziz, told The New York Sun. "We will never disarm until all issues are settled, including a complete Israeli withdrawal from the West Bank and Jerusalem and the right of return for all Palestinian refugees." A leader of the Al-Aqsa Martyrs Brigades in Ramallah, Abu Yousuf, told the Sun that Mr. Abbas's claims that the Brigades will disarm "are more of a message meant for the Israelis, the Americans, and the international community." The Palestinian Arab territories are run by two warring mini-authorities. One of them -- spread over the West Bank -- is headed by President Abbas of Fatah, a man whose powers barely extend to the porch of his residence in Ramallah. The other, headed by Hamas, is a large collection of gangs, terrorists, and jihadist groups in the Gaza Strip. Neither side has any constituents who can make a deal, keep one if it were made, or even deliver on any pact with other Arabs, let alone with the Israelis. That has been true for 60 years. In this circus, Mr. Abbas has been nothing but a convenient distraction. Since his days as a gofer for the unlamented Yasser Arafat, he has never commanded anyone. Palestinian history is a kind of tragedy: formally offered a state at least five times (in 1937 by the Peel Commission, in 1947 by the UN, in July 2000 by Israel at Camp David, in December 2000 by the Clinton Parameters, and in 2003 by the Quartet’s Road Map), the Palestinians rejected it five times, always continuing to “fight” for a state they could have had by simply stopping their fight. Assuming a state was what they wanted. But the history of the many attempts to give Palestinians the state they say they wanted may be coming to an end, as Gaza is turned into an Islamic enclave and the weak remnant of the ancien regime is kept on life support by an international community that thinks Mahmoud Abbas is the hope for peace (just as it previously thought Arafat was). Ed Lasky reminds us how inconsistent both the words and actions of Abbas have been with any real movement toward acceptance of Israel. Earlier this year, Abbas re-iterated that the “right of return” was “non-negotiable.” He personifies a Nebech strategy that generates unending financial support but never actually requires the dismantlement of any terrorist infrastructure. David Singer reminds us that “the Palestinians” were a relatively recent historical construct, and he provides some useful lessons from the first partition effort by the 1937 Peel Commission. It is not too late to apply those lessons to the history that is unfolding now. Arafat learned from the "international community" that no one would look too closely at where its foreign aid was spent. But a reputation for theft has been the undoing of Fatah. Arafat thought he could harness the religious power of "martyrdom" to his political ends. But at the core of every suicide bombing is an act of self-destruction, and a nation that celebrates the former inevitably courts the latter. Above all, Arafat equated territory with power. But what the experience of an unoccupied Gaza Strip has shown is the Palestinians' unfitness for political sovereignty. . . . Nothing has so completely soured the world on the idea of a Palestinian state as the experience of it. What does this mean for the future? . . . . " Palestine," as we know it today, will revert to what it was -- shadowland between Israel and its neighbors -- and Palestinians, as we know them today, will revert to who they were: Arabs. . . .
[T]he dream that was Palestine is finally dead. Still, as Anne Lieberman notes, fools rush in, ignoring what history has now demonstrated multiple times is a farce, if not a theater of the absurd. Those seeking a legacy should look elsewhere. While they try to organize a sixth formal offer, Iran is close to a nuclear weapon that will really change history. So what is Palestine? It is an improvisation from a series of rude facts. Palestine was never anything of especial importance to the Arabs or to the larger orbit of Muslims. Palestine was never even an integral territory of the Ottomans but split up in sanjaks that crossed later postWorld War I borders, a geographical and political jumble. When General Allenby captured Jerusalem, it was a great happening for believing Christian Europe, not a tragedy for Islam. When the 1947 U.N. Partition Plan for Palestine was passed, envisioning a "Jewish" state and an "Arab" (not, mind you, Palestinian) state, even the idea of a separate Arab realm was met at best with a yawn. Though almost no Arab wanted Jewish sovereignty in any of Palestine, virtually no Arab seemed to crave Arab sovereignty, either. Foreign Arab armies did the fighting against the Haganah, and foreign states sat for the Palestinians at the cease-fire negotiations, as they had sat for decades at the international conferences on Palestine convened by the powers. Palestine was being fought over to be divvied up by Cairo, Amman, and Damascus . . . . Indeed, from 1949 through 1967, what was the West Bank of Arab Palestine was annexed -- yes, annexed -- by Jordan, and what was the Gaza Strip was a captive territory of Egypt, unannexed so that Gazans had no rights as Egyptians (whereas the West Bankers had rights as Jordanians). The Palestine Liberation Organization, founded in 1964, was not founded to liberate these territories. It was founded to liberate that part of Palestine held by Israel. . . .
Ehud Olmert gladly would have signed on the dotted line if the Palestinian Authority could bring itself to realize it would get what it could get (and perhaps even a little more) if the Palestinians would finally stop their war against the Jews. And their rage. But the Palestinians' war against the Jews is actually also a war against one another. . . .
U.S. policy must not assume that there are facile ways to render the West Bank peaceful. Almost everyone has admitted, some with bitterness, that what keeps that area of Palestine more orderly than Gaza is the proximate presence of Israeli troops near Arab population centers. Would that there were a mature national will among the Palestinians. It might even be able to temper the rage of the Arabs against one another. Not until their sense of peoplehood conquers their rage against one another will they be in the psychological position to think of peace with Israel . I doubt this will happen any time soon. This is the end of Palestine, the bitter end. Sunday, June 24 at 3 p.m. at Stephen S. Wise Temple -- Eli Hertz, introduced by Yaron Gamburg, Deputy Consul General of Israel. It is still led by foreigners called al-Qaeda Senior Leadership (AQSL). Our assessment is that this is the central front for al-Qaeda. They have a global war of terror, and Iraq is the central front. Whether you like it or not. That is something that the leaders of the intelligence community in the West and our joint special operations commander agree on and that is why he is here two thirds or three quarters of his time. It is certainly one very important consideration in looking at Iraq." The interview is worth reading in its entirety. [The play] is a brave piece of dissent that forces us to confront our preconceptions. Or would, if anyone in the audience didn’t already share the author’s preconceptions about other people’s preconceptions. The play is described as “provocative.” Naturally. There's no finer word in the modern artist’s lexicon. That’s the role of art: to resist the affirmation of societal confidence, because it leads to things like war and big cars and bigger houses in cul-del-sac burbs where pot-bellied yobs have an entire room for their NASCAR cap collection. This cannot stand; the center must not hold. That rough beast isn’t going to birth itself, you know; we have to rip it out, saddle it up and ride all the way to Bethlehem so we can get on with whatever comes next. And whatever it might be it has to be better than this, because THIS is television-as-anesthesia, food packed in tinfoil, guns in all the wrong hands (citizens and soldiers, neither of whom can be trusted) and a general willful refusal of everyone else to understand that this is possibly the nadir of human civilization right here, and if they’d stop enjoying their life for one – single – second for a change, they’d realize it. Over here, look at us! We are provoking you! . . . .
As Blair notes, a play that makes fun of the other side would be provocative, but it would never enter their minds to do a play about a kid whose head gets lopped off because he declares Salman Rushdie his hero. On some level they realize that the backlash would be dangerous . . . . The Tim Blair post is worth reading in its entirety. We need to remember that the same Palestinians who reportedly tell pollsters they support a two-state solution with Israel gave their vote to the party that opposes any peace with Israel in January 2006. We need to remember that Palestinian president and Fatah leader Mahmoud Abbas, who has repeatedly said he rejects violence and endorses the two-state solution, legitimized Hamas's rejectionist alternative by entering into a power-sharing agreement with the group in the February 2007 Mecca accord. . . . There are some in the administration who are saying "I told you so" -- claiming that the Palestinians needed a political horizon to have something to fight for, that if only we had articulated a detailed vision of the eventual Palestinian future and sketched clearly the borders of the Palestinian state and the defined pathway that would reach it, then Fatah fighters would have had the ideological fire in their bellies. Advocates of this point of view, I am afraid to say, are operating under a delusion. As a forty-eight-year-old Fatah military officer was quoted as saying after his arrest and subsequent release in Gaza last week: "We decided to surrender because we didn't feel that our commanders and leaders were behind us. Many of our commanders had fled to Ramallah and Cairo, where they were issuing orders to us from air-conditioned hotel rooms." In essence, Fatah lost because the rot was too deep, and the equivocating answer that Fatah was offering the Palestinian people -- sometimes working hand-in-hand with Hamas, sometimes opposing Hamas -- was murky, muddy, and muddled. This was not, at the core, an American problem and was not fixable by American solutions. But the United States, joined by the weakest, least experienced and most tired Prime Minister in Israeli history, now appear poised to double down on Mahmoud Abbas, and send hundreds of millions of dollars to a party viewed by Palestinians as not only corrupt but demonstrably inept -- without even a requirement that Abbas first commence “sustained, targeted, and effective operations aimed at confronting all those engaged in terror and dismantlement of terrorist capabilities and infrastructure” -- even in the rump state of the West Bank. Is this really what George W. Bush envisioned in his landmark speech on June 24, 2002? It's not just the [failed and defeatist] policies. It's also the defeatist state of mind. All day long people are screaming "Peace, peace, and gestures, gestures!" Concessions and disengagements were made and settlers expelled. All this has ultimately achieved the opposite result. We have to stop the empty slogans such as "Peace is made with enemies and not with friends." In order to achieve peace we must first and foremost be prepared for war. We have to change this state of mind at the core. It wasn't only the Romans who said that those who seek peace should prepare for war. Even in game theory, for which I received the Nobel Prize, says so. We have to be emotionally prepared to bear and to inflict casualties – and not to scream "peace, peace," all day long. Only if we are prepared to kill and be killed – we shall not be killed. This is the paradox of war. Aumann. . .[T]here is almost nothing as ever-present in the history of mankind as war. Since the dawn of history we have had constant wars. . . . A tremendous amount of energy is devoted on the part of a very large number of well-meaning people to the project of preventing war, settling conflicts peacefully, ending wars, and so on. Given the fact that war is so, so prevalent, both in time and in space, all over the world, perhaps much of the effort of preventing or stopping war is misdirected. . . . [G]iven the constancy of war, we should perhaps shift gears and ask ourselves what it is that causes war. Rather than establishing peace institutes, peace initiatives, institutions for studying and promoting peace, we should have institutions for studying war. . . . It’s like fighting cancer. One way is to ask, given a certain kind of cancer, what can we do to cure it? . . . Another way is simply to ask, what is cancer? How does it work? . . . Once one understands it one can perhaps hope to overcome it. . . .
H: So, the standard approach to war and peace is to . . . try ad hoc solutions. You are saying that this is not a good approach. . . .
Aumann: Yes. . . . Saying that war is irrational may be a big mistake. 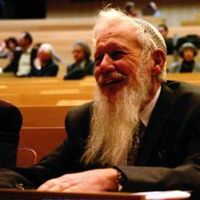 If it is rational, once we understand that it is, we can at least somehow address the problem. . . .
H: Here in Israel, we unfortunately have constant wars and conflicts. . . . You presented [at the Center for Rationality] some nice game-theoretic insights. Aumann: One of them was the blackmailer’s paradox. Ann and Bob must divide a hundred dollars. . . . Ann says to Bob, “look, I want ninety of those one hundred. Take it or leave it; I will not walk out of this room with less than ninety dollars.” Bob says, “come on, that’s crazy. We have a hundred dollars. Let’s split fifty-fifty.” Ann says,” no.” . . . [I]t’s not enough for her just to say it. She has to make it credible; and then Bob will rationally accept the ten. . . . This is the blackmailer’s paradox. It is recognized in game theory . . . What is the application of this to the situation we have here in Israel? Let me tell you this true story. A high-ranking officer once came to my office at the Center for Rationality and discussed with me the situation with Syria and the Golan Heights. . . . He explained to me that the Syrians consider land holy, and they will not give up one inch. When he told me that, I told him about the blackmailer’s paradox. I said to him that the Syrians’ use of the term “holy,” land being holy, is a form of commitment. . . . Just like in the blackmailer’s paradox, we could say that it’s holy; but we can’t convince ourselves that it is. One of our troubles is that the term “holy” is nonexistent in our practical, day-to-day vocabulary. It exists only in religious circles. We accept holiness in other people and we are not willing to promote it on our own side. The result is that we are at a disadvantage because the other side can invoke holiness, but we have ruled it out from our arsenal of tools. H: On the other hand, we do have such a tool: security considerations. That is the “holy” issue in Israel. 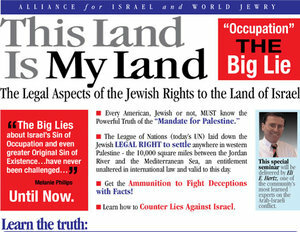 We say that security considerations dictate that we must have control of the mountains that control the Sea of Galilee. There is no way that anything else will be acceptable. Throughout the years of Israel’s existence security considerations have been a kind of holiness, a binding commitment to ourselves. The question is whether it is as strong as the holiness of the land on the other side. Aumann: It is less strong. After years of inculcating an excessive, self-denying respect for the “Other,” accepting competing “narratives” as equally valid regardless of their basis in fact, and luxuriating in post-Zionist moral equivalence, Israel need to recover a sense of its own holiness. It needs to re-establish certain basic facts. Some of them are set forth in a short video that Melanie Phillips last week correctly described as “must-see.” Unless it reasserts them, Israel will eventually become a victim of the blackmailers arrayed against her. Statement by Columbia University President Lee C. Bollinger on June 12, 2007 on the British University and College Union Boycott of Israel. As a citizen, I am profoundly disturbed by the recent vote by Britain’s new University and College Union to advance a boycott against Israeli academic institutions. As a university professor and president, I find this idea utterly antithetical to the fundamental values of the academy, where we will not hold intellectual exchange hostage to the political disagreements of the moment. In seeking to quarantine Israeli universities and scholars this vote threatens every university committed to fostering scholarly and cultural exchanges that lead to enlightenment, empathy, and a much-needed international marketplace of ideas. At Columbia I am proud to say that we embrace Israeli scholars and universities that the UCU is now all too eager to isolate -- as we embrace scholars from many countries regardless of divergent views on their governments' policies. Therefore, if the British UCU is intent on pursuing its deeply misguided policy, then it should add Columbia to its boycott list, for we do not intend to draw distinctions between our mission and that of the universities you are seeking to punish. Boycott us, then, for we gladly stand together with our many colleagues in British, American and Israeli universities against such intellectually shoddy and politically biased attempts to hijack the central mission of higher education. 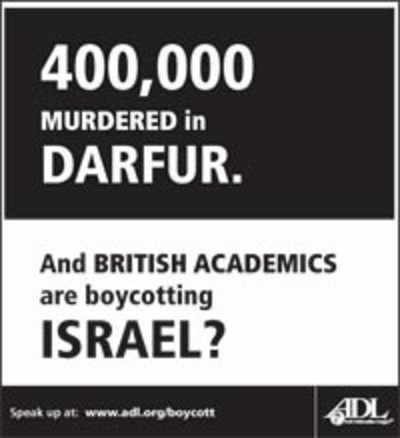 Is the British Academic Boycott Anti-Semitic? Anthony Julius, the brilliant British jurist who defended Deborah Lipstadt in her libel trial (and who coined the phrase “Jews proud to be ashamed to be Jews” to describe Jewish anti-Semitism), has teamed with Alan Dershowitz to write “This Boycott is Not Just Wrong – It’s Anti-Semitic” in today’s London Times. (The full-length version of the article is here). There is an edge of malice to [the British boycotters’] campaign. Their desire to hurt, to punish, outstrips their ability even to identify with any precision their targets -- all Israeli universities without exception? All academics within those universities? Israeli academics in non-Israeli universities? They cannot say. And so the question arises -- does this malice have a name? To be blunt, is it anti-Semitic? The academic boycott resonates with earlier boycotts of Jews, whether those of medieval Europe or the Third Reich. The history of anti-Semitism is in part the history of boycotts of Jews. Each boycott derives from a principle of exclusion: Jews and/or the Jewish State are to be excluded from public life, from the community of nations, because they are dangerous and malign. We see an essential continuity here, but even if we are wrong about this, the boycott has indeed been an essential tool of anti-Semites for at least a thousand years. And who but the crassest of individuals, those least sensitive to the burden of anti-Semitism’s history on Jews, would wish to impose precisely that sanction on the Jewish State today? Second, it is predicated on the defamation of Jews. The Jewish State, in pursuance of its racist ideology, is perceived as pure aggressor, and the Palestinians as pure victims. The boycotters . . . are outraged by the Jewish nature of the State of Israel, but are untroubled (say) by the Islamic nature of Iran or of Saudi Arabia. They regard Zionism as uniquely pernicious, rather than as merely another nationalism. They are indifferent to Jewish suffering, while being sensitive to the suffering of nonJews. They overstate, on every occasion, and beyond reason, any case that could be made against Israel’s actions, and wildly overstate the significance of the Israel/Palestine conflict -- indeed, they put Jews at the centre of world affairs. Longstanding anti-Semites now embrace “anti-Zionism” as a cover for their Jew-hatred. This is because, in relation to Israel, the antiSemite finds a protected voice. The desire to destroy Jews has been reconfigured as the desire to destroy or dismantle the Jewish State. Boycotters may have Jewish friends, they may be Jews themselves -- but in supporting a boycott they have put themselves in anti-Semitism’s camp. - In the very first weeks of the third Reich, on April 1, 1933, Hitler ordered a boycott of Jewish shops, banks, offices and department stores. Signs were posted “Don’t Buy from Jews” and “The Jews Are Our Misfortune”. Uniformed Nazis, some armed with rifles, stationed themselves in front of Jewish business premises, and barred customers from entry. Cars circulated in the street broadcasting slogans condemning buying from Jews. The Nazi boycott was intended to isolate German Jews from their non-Jewish fellow citizens. . . .
- And in 1945, barely 12 years later, the Arab League initiated a boycott of Jewish Palestinian businesses. It prohibited Arab States from doing business both with “Zionists”, and with any third parties who themselves might be doing business with Zionists. The object was to isolate and weaken the Palestinian Jewish community. One year later, the ban was extended to prohibit contact with “anything Jewish” (as the Palestine Post reported, quoting a League announcement). This economic warfare continues to the present day. . . .
Each boycott derives from a principle of exclusion: Jews and/or the Jewish State, are to be excluded from public life, from the community of nations, because they are dangerous and malign. . . .